The in-ceiling speaker (pictured on the ceiling), in-wall speaker (left on the wall) and the outdoor speaker (right on the wall). Wireless speaker manufacturer Sonos has partnered with architectural speaker maker Sonance, unveiling a collection of speakers optimized for the Sonos amplifier that will be available for purchase beginning February 26. This collection includes a $599 pair of in-ceiling speakers, $599 pair of in-wall speakers and a $799 pair of outdoor speakers. When paired with a Sonos amplifier, the in-ceiling and in-wall speakers will unlock Sonos' proprietary tuning technology, Trueplay, one that analyses factors like room size, layout, speaker placement, décor and other acoustic characteristics before sound output. It's able to do this by use of an iPhone, iPad or iPod Touch. Up to three pairs of the new speakers can be powered by a single Sonos amplifier, with all of them featuring ''dynamic bass processing to enhance low frequencies for a richer listening experience.'' The in-ceiling speakers are designed round, or optional square, with grilles that can be painted to match ceiling colours. 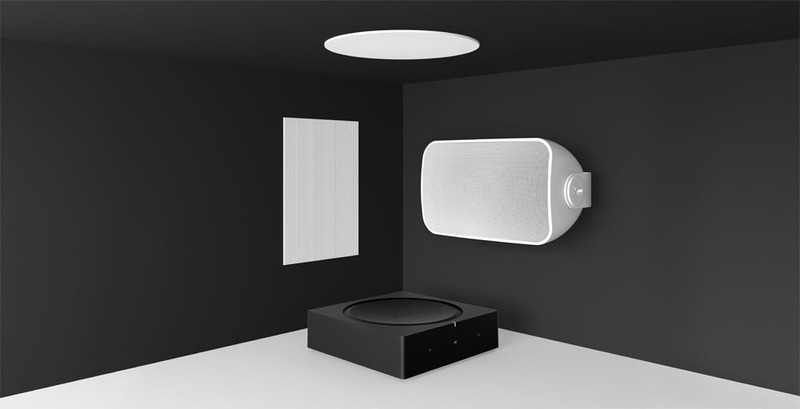 The in-wall speakers also feature grilles that can be painted to match the wall while the outdoor speakers are made to withstand environmental factors like humidity, salt spray, UV rays, heat and freezing temperatures, Sonos says. The speakers, dubbed "Sonos Architectural by Sonance" come with the usual benefits of Sonos speakers like an app that works with music streaming services, regular software updates, AirPlay 2 control and the ability to add additional Sonos speakers and components to a setup. The Sonos Amplifier is available for pre-order and will begin shipping February 12. The in-wall and in-ceiling speakers are also available for pre-order and will begin shipping on the 26th of this month. The outdoor speakers will follow suit, becoming available in April.